Over the summer, we are going to feature our various Legal Design Lab team-members, and we start with Metin Eskili, our chief technologist. Metin is a full-stack application developer who works on access to justice technology and machine learning for legal help. Since he joined our team, Metin has been busy building apps to help people navigate disaster relief, eviction, family/probate court, criminal procedure, and beyond. He’s built mobile apps, websites, guide-builders, and text message automation platforms. These ideas have all come out of our design workshops and classes — then Metin and our teams of students and designers refine them into real, working technologies. This summer, Metin is focused on crowdsourcing and machine learning work on our AI + Legal Help project. Metin is building our crowd-labeling platform Learned Hands, so we can have lawyer and law students label court sites and people’s legal help requests. This will help our team train machine learning models to do this labelling automatically — and help match people with free, public resources. 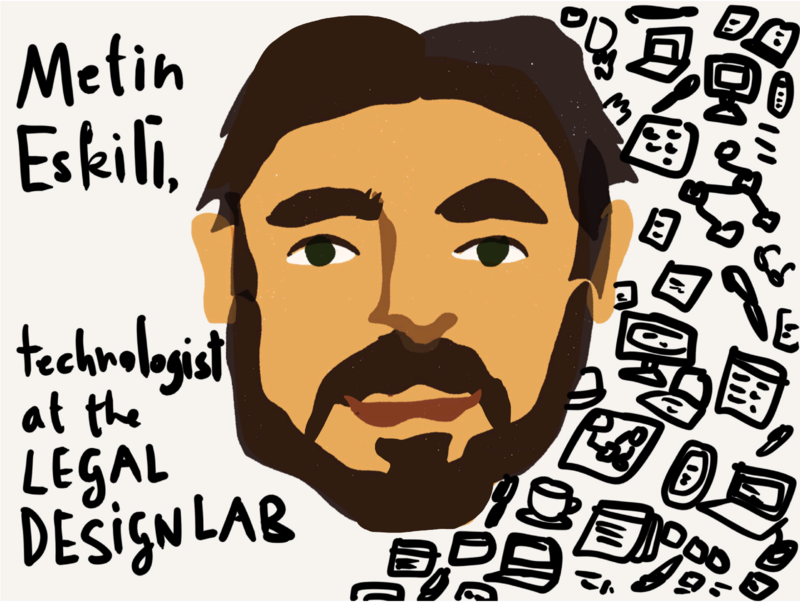 Here’s a short interview with Metin about his journey to working on the justice system + how technology can make legal services better. Hi, Metin! What did you do before working on legal technology? I’m a computer scientist — though I had actually started at teacher’s college when I was 17, to become a math teacher. But then after 1 year, I switched to engineering. My uncle was a programmer and I was inspired by him. After 2 years, though, my uncle switched from programming to become a math teacher. Before I started working on law-related applications, I worked with a university in Turkey to create e-learning systems. We developed platforms, mostly using Microsoft technologies, to make education more open — so that a 4 year degree could be done online, in an open way. I liked that job because I got to work for students, and it was about helping others. I met a lot of people who were taking courses on that platform, and it felt great. That same platform ended up being used by 30 universities around Turkey, with more than 200,000 students. It scaled out really well. Did you ever work on law before? I never had any experience with law before I started working on Legal Design Lab projects. Except for immigration, and applying for visas, assembling papers, going to interviews. I’m still a little scared of law — because it’s so complicated — more than software development. Actually, I learned more legal things from doing all this tech development. I know my rights better now — and I know a lot of lawyers. In Turkey, where I come from, the laws and the system are very different from here. What’s it like to work with lawyers and law students all the time? My role in all of these is to be the technical lead. I am in charge of making these ideas into reality. I have to tell the lawyers what’s possible, and what’s not. And I have to figure out what’s the most efficient and friendly way to develop the designs into real applications. When I work with lawyers and designers, I need to try to explain the technical parts in the easiest possible way — because law and software developers talk in such different languages. Sometimes it’s hard to understand each other. I try to avoid overly technical details — instead focusing on what we can do, and what we can’t do, and the general steps and strategies of how we’ll do them. I draw lots of diagrams to make it easy to explain. What are some projects that you’re inspired to work on in the near future? Some of the real-world projects inspired me to do technical projects — like I want to work on augmented reality navigation through a court building. That came out of some design discussions about guiding people through court through signs or bluetooth. I’m seeing other ways to make it easier to navigate court. I go through two big phases in my work — figuring out big creative new solutions, and then stomping out lots of small problems, bugs, errors. The projects always have small problems that crop up, and I’m constantly finding little solutions to solve them. It can take a full day to figure out how to solve the problem. I love this job because it’s creating something new, and people will benefit from it. Keeping this in mind, it keeps me happy. This is why I left math teaching — to create new tools and things. Over the next five years, I want to see the applications we are building now to scale out just like the e-learning platform I had built before. I want to make sure that all of these navigation, know-your-rights, and AI tools we are building actually serve the people. I want to see all the work we are doing make a difference.